When looking for a quality gift for employees and clients, try branded Bettoni pens! These sleek and stylish utensils from the Bettoni collection are sure to draw attention. Break the ice with potential clients, solidify existing relationships, or show your appreciation. These elegant pens are durable and reusable. Your logo will be prominently displayed each time the recipient jots something down. Customize your own Bettoni pens with ePromos! This custom pen has solid brass, stylish ergonomic barrel pen and the appeal to show your company's strength. Make sure you show your strength with the Levante Metallic Finish Ballpoint Pen by Bettoni . This elegant imprinted pen has mother of pearl and black onyx barrel inserts. Imprinted pen with shiny nickel finish and colored leather barrel. Promotional pen has a twist tip mechanism with diagonal stripe design. This ballpoint promotional pen made of solid brass with gloss black finish and twist mechanism. Roller ball promotional pen made of solid brass with shiny chrome finish and carbon fiber barrel. A classic Bettoni promotional pen with the addition of a stylus. 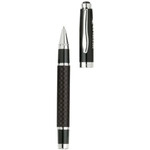 Promotional rollerball pen with chrome trims and a woven steel design on the barrel. Carbon fiber barrel promotional pen with a gloss black cap is laser engraved to last a lifetime! Promotional ballpoint custom pen with chrome trims and a woven steel design on the barrel. Carbon fiber barrel promotional pen with a gloss black cap is laser engraved to last a lifetime. Aolid heavyweight brass engraved rollerball in blue or black exterior. Available in silver or gunmetal style, this Engraved Executive Pen makes your logo shine. This rollerball imprinted pen is made of solid brass with gloss black finish and cap-off design. Looking to step up your marketing game with a classy promotional campaign? Customized Bettoni pens are your answer. These exquisitely-made executive pens, engraved with your logo, are a great way to get your brand noticed. They make easy gifts for any occasion. Buy in bulk so you can pass them out in gift baskets at events. Get pens for your employees to keep them looking professional when taking notes in client meetings. Or show a current client you care with a sleek looking onyx or chrome pen. These pens are durable and refillable so your logo is displayed for the long haul. We can help you design a logo or work off your existing artwork. Browse our selection and give our promotional product experts a call today to get started.